10% discount for RT 1 BNG members & 10% referral fee for Rt. 1 BNG members! 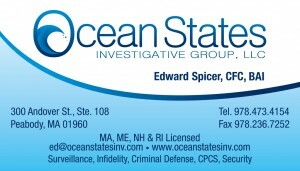 A fully licensed, bonded & insured Massachusetts Private Investigative Company that provides a wide range of services to clients throughout the United States. OSIG is also licensed in Maine, New Hampshire & Rhode Island with colleagues throughout the United States. A full service private investigative & security services firm, OSIG was formed in 2004 to provide high quality, cost effective investigative services for the insurance and legal communities as well as the private individual. The staff of male & female investigators is strategically located throughout Eastern Mass & reputable colleagues throughout the rest of the country. The staff has years of combined experience in workers’ compensation, human resources, risk management, law enforcement, corrections, investigations, executive protection and security services.